The Segovia-Ponce Letters. Translated by Peter Segal. 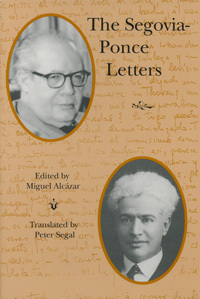 129 letters written by Andres Segovia to Manuel M. Ponce, beginning with their acquaintance in 1923 and terminating with Ponce’s death in 1948. A bi-lingual, Spanish-English edition. This is an unabridged edition, including the full text of all the letters available today. A historical document of major importance, for the study of the life and personality both Segovia and Ponce. An essential source material for a Segovia biography, written by the Maestro himself. Includes a General Index. Yes, we can ship this item to Mexico. The shipping costs will vary depending on which method you select but standard shipping will likely be about $12.00-$15.00 dollars. Once you place an item in your shopping cart and proceed to the checkout screen the shipping options and costs will be displayed.